If you’ve seen me lately, you’ve probably noticed a new accessory on my wrist. Sure, it looks like a cool new bracelet that I decided to start rocking… but it’s way more than that! It’s the new Fitbit Charge! I’ll be wearing it all month long as part of the SHAPE and Men’s Fitness East vs. West Fitbit Blogger Challenge! You know and I know that EVERYONE reading this post has thrown up an East or West Side gang sign before. Well, that’s what this is, a good ol East vs. West throwdown. Or is it walk off? The challenge includes 20 bloggers, 10 on each team (EAST SIDE!!!) and we are using the Fitbit to log our active minutes, steps taken, and total distance. You can view the challenge scoreboard at anytime by visiting either http://shape.com/fitbit or http://mensfitness.com/fitbit. Why view the scoreboard? Well, to see how my team is doing… AND… to sign up to win your very own Fitbit Charge! More on that in a minute. This contest is a weekly challenge, for a four week duration. Each week, the teams at SHAPE and Men’s Fitness will issue a #MotivationalMondays challenge. I’ll be writing a post telling you how I completed the challenge later in the week. The first week’s challenge was to take my workout outside and go on a hike or trail run. Well, I used this opportunity to spend my lunch walking the one mile track right outside my work! It was a good walk, a little chilly with the wind, and I’m pretty sure I saw some extra terrestrial object. I know the photo cut some of the display out (stupid technology) but I started at 4445 steps. The loop was a nice mile, and about 3/4 of the way through, I saw this thing. Seriously, WTF is that?? Pretty sure that’s an alien brain. There were more hanging from a tree, so maybe there was a Predator nearby? Anyways, I made it past the alien spores/brains/poop/whatever and finished my walk. I didn’t time myself, I just went at a nice pace and enjoyed myself. And guess what? I got almost 2000 steps from that mile! Again, that’s my iPhone making the photo weird, not the Fitbit! Or, it could be the aliens…! So there’s always a way to get a little workout in, even if you don’t have time before or after work. I could briskly walk a mile or two and that would suffice and definitely be better than nothing! My goal on my Fitbit is set at 10,000 steps per day. This translates to just under 5 miles worth of distance for me. 5 miles! That’s a lot when you think about it, that I should be moving that much every day. Already, I find myself being more aware of my inactivity, and the Fitbit reminds me to get up and stretch my legs and get moving away from my desk. With the Fitbit, it automatically tracks everything from steps, distance, calories burned, stairs and even sleep! I love how it syncs wirelessly with my iPhone and I love to see my sleep quality. So, what should you do? You should check out the leaderboard at http://shape.com/fitbit and/or http://mensfitness.com/fitbit and toss an EAST SIDE my way! Then, go enter to win a Fitbit Charge! 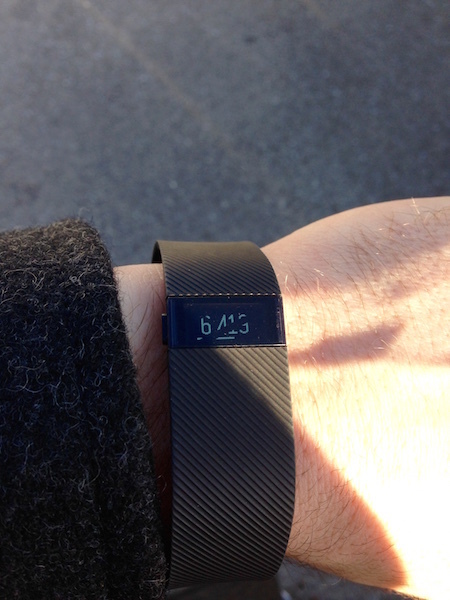 Valued at $130, a new FitBit would be a great addition to a new year of fitness! You can check out @fitbit at all the major social medias. And as always, don’t forget to check me out as well! You know where to find me.